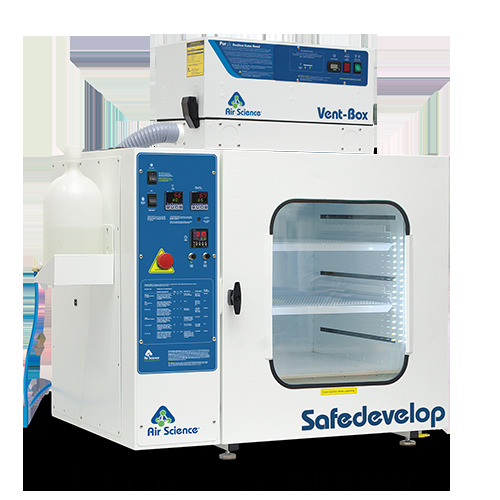 Safedevelop™ Fingerprint Development Chambers are designed to accelerate the processing of latent finger-prints on porous surfaces using DFO, Ninhydrin, and other development chemicals within a controlled environment for optimum effectiveness where moisture, temperature, and time are critical factors. 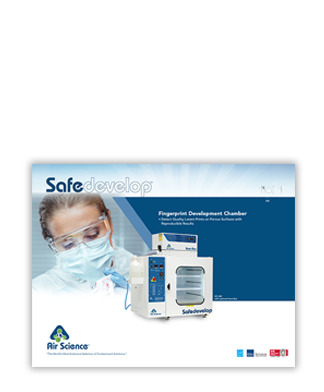 The Safedevelop Fingerprint Development Chamber controls all functions from start-to-finish, permitting the investigator to initiate an unattended cycle, establish the proper development intensity and duration, and to return upon completion to collect results. The resulting prints will fluoresce with the use of various lasers and light sources. Designed for developing fingerprints on documents using Ninhydrin, DFO, Nickel Nitrate, 5-MTN, 1,2-Indanedione and Zinc Chloride. Effectively controls temperature, relative humidity, and development time. Fingerprints are detected at a faster rate, and with better clarity, by precisely controlling conditions of high temperature and high relative humidity. DFO and Ninhydrin fuming are the most effective techniques for detecting latent prints on paper and similar porous surfaces. Safedevelop performs well with DFO and Ninhydrin, however is not limited in scope and can also utilize other chemical developers, allowing illumination with various lasers and light sources to make the resulting prints fluoresce. Controls. 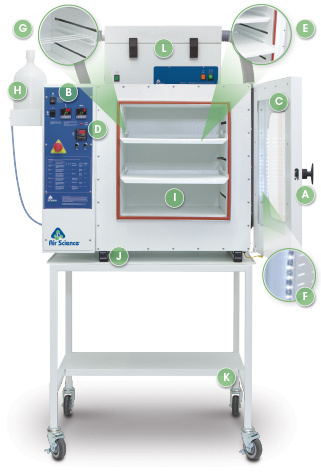 The professionally designed automatic development chamber eliminates reliance on do-it-yourself systems that lack user-safety allowances and controls needed for repeatable results. Profile Settings. To change between profiles requires only the press of a few buttons on an easy to use LED display. Profile Recovery. The chamber features rapid condition recovery following a door opening. Fast Processing. The wide temperature and humidity range allows fingerprints to be processed in a matter of minutes - not days like some conventional methods. Steam Generation Technology. The steam generator produces humidity by a sealed, automatic, steam injection system, ensuring only vaporized water enters the sample chamber to eliminate possibility of contaminating samples with water droplets. Flexible Configuration. The chamber's generous working area and flexible shelving and rod system enable large batches of operational material to be processed quickly and easily. 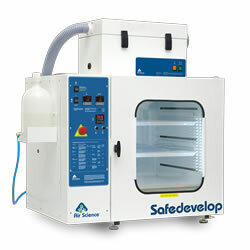 Safedevelop shown with optional cart and optional Vent-Box Modular Filtration. A. Door Key: Chamber access keys prevent unauthorized removal of evidence or accidental operator exposure to chemical fumes or high heat. B. Control Panel: Front-mounted control panel with electronic On/Off switch, lights, temperature and humidity controller, cycle complete lamp and low water alarm lamp. C. Glass Door: Multi-pane, heated glass door minimizes condensation and activates automatically whenever humidity is used. D. Low Water Light: Low water level warning light notifies the operator when to add water. E. Push-Pull™ Shelving: perforated Push-Pull™ shelves that can slide in or out with one hand. F. Lighting: Dual LED light strips on the door provide a large illumination area to watch fingerprints being developed. G. Hanging Rods: Removable stainless steel hanging rods with clips. H. Water Carboy: Side mounted, 1 gallon (4 liter). Easy to visualize water levels and quick release coupling for simple removal and filling. I. Chamber: Corrosion-resistant insulated internal chamber. J. Leveling: Adjustable leveling feet. K. Stand: Optional mobile cart with locking casters. L. Modular Filtration: Optional Vent-Box filtration unit available with Multiplex filtration technology, a unique configuration that includes a pre-filter and main carbon filter. HEPA/UPLPA filtration is also available. Quality Door Construction: The large viewing area offers easy observation of critical samples along with dual vertical LED lights. The multi-pane, heated glass door minimizes condensation. Steam Generator: The Air Science steam generator adds heat while humidifying, providing for quick ramp-up and rapid condition recovery after door openings. Advanced humidity sensors with built-in temperature compensation provide accurate readings at all temperatures. Preset Profiles: Preset development profiles are saved onto the controller to comply with lab safety protocols and best practices in evidence management.